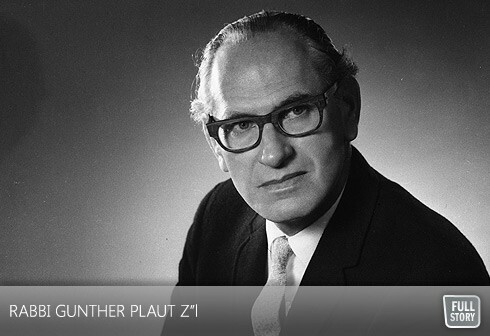 Those words were written by Rabbi Gunther Plaut, z”l, a well-respected spiritual leader, world-renowned scholar, and accomplished author who passed away on February 9, at 99 years of age, after decades of doing just that – serving humanity. Rabbi Plaut, who came to Toronto in 1961 after serving as a rabbi in Chicago and St. Paul, was the senior scholar in residence at Toronto’s Holy Blossom Temple at the time of his death. He retired from his post as Holy Blossom’s Senior Rabbi in 1978. Rabbi Plaut was a former Campaign Chair of United Jewish Appeal of Greater Toronto as well as a former President of Canadian Jewish Congress. Rabbi Plaut, laid to rest on Sunday, February 12th at Holy Blossom Temple, is predeceased by his wife Elizabeth, by his parents Jonas and Selma Plaut, and his brother Rabbi Walter Plaut. He is survived by his children, Judith Plaut and Rabbi Jonathan V. and Carol Plaut; his grandchildren, Daniel and Amy Plaut, and Deborah and David Elias and his great grandson, Steven Elias. “W. Gunther Plaut, father and husband, son and grandfather, brother and uncle; eminent man of letters; a rabbi of the word and the deed, was swift like the eagle, strong like the lion. He was a prince and a great man of Israel, and now he has died,” Holy Blossom’s Rabbi John Moscowitz said in his eulogy. “The eagle soars above all, the lion is mighty on land. One is master of the skies, the other will never yield the ground. Each is esteemed by the Bible, one bearing the next generation on its wings, the other a symbol of pride and courage. Born in Germany, Rabbi Plaut studied at the Universities of Heidelberg and Berlin, and received the LLB Doctor of Laws in 1934. He fled from Hitler in 1935 for the United States, and the Hebrew Union College in Cincinnati, where he was ordained in 1939. He served as a chaplain with the United States Army during World War II, and was at the European front with the 104th Infantry. Decorated with the Bronze Star Medal, Rabbi Plaut - who, among other honours, was a Companion of the Order of Canada, and received the Order of Ontario - was the first rabbi to bring a Sefer Torah back to Germany and held the first free service in a German synagogue, in the burned-out shell of the Cologne Synagogue in 1945. Rabbi Plaut was also present at the capture of the Dora-Nordhausen concentration camp in Germany in April, 1945. And, according to Toronto’s Mendy Sharf, a longtime friend and neighbour of Rabbi Plaut, the rabbi’s devotion to Judaism knew no bounds, even during the perils of war. And, on October 19, 1971, with Soviet Premier Alexei Kosygin visiting Ottawa, it was Rabbi Plaut leading over 12,000 Jewish men, women and children, standing arm-in-arm with them outside the Soviet Embassy, chanting, “Let our People go!” They were there, led by Rabbi Plaut to protest the common Soviet practice of not allowing its Jewish citizens to practice their faith, speak their language or make aliyah. He published over two dozen books on theology, philosophy, and history, as well as works of fiction. His best known work is The Torah - A Modern Commentary, which was published by the Union of American Hebrew Congregations, the umbrella organization for Reform Jewish congregations in North America. This opus, which has sold nearly 120,000 copies, quickly gave Rabbi Plaut worldwide prominence. Truly a renaissance man, Rabbi Plaut, who, in the 1950s had his own television program and for 12 years, his own weekly radio program, was an avid chess player and golfer. In fact, in 1935, he represented Germany on its tennis and soccer teams during the Maccabiah Games. “Rabbi Plaut’s importance to Canada’s Jewish community cannot be overstated,” said Rabbi Adam Cutler of Beth Tzedec Congregation.